BSU’s grounds crew won a Spirit of BSU award for their tireless efforts to keep the campus clear of snow this winter. Angie Gora (right) won the Spirit of BSU Award. She’s pictured with VP Karen Snorek (left) and President Hensrud. Dr. Andy Hafs, associate professor of biology (right), won the Excellence in Teaching Award. 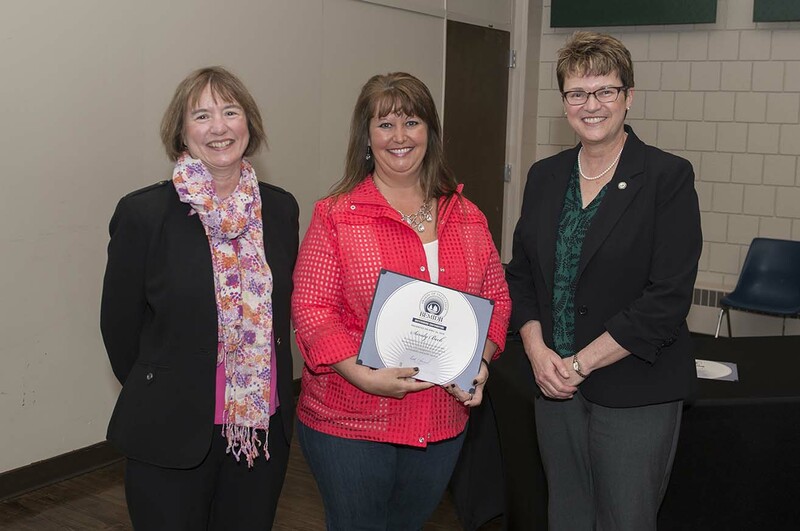 She’s pictured with VP Karen Snorek (left) and President Hensrud. 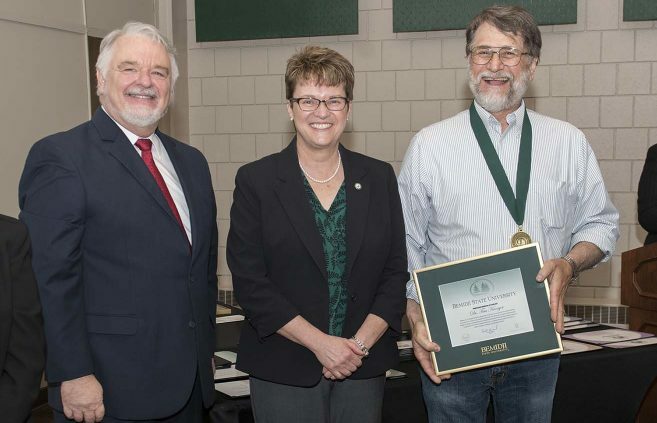 University photographer John Swartz (center) won a Distinguished Service Award. 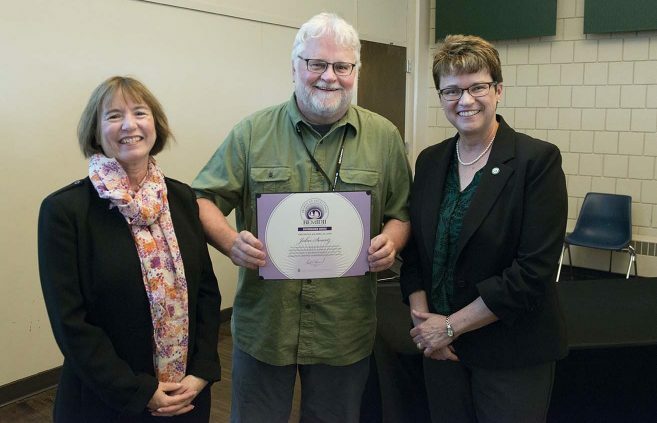 He’s pictured with VP Karen Snorek (left) and President Hensrud. 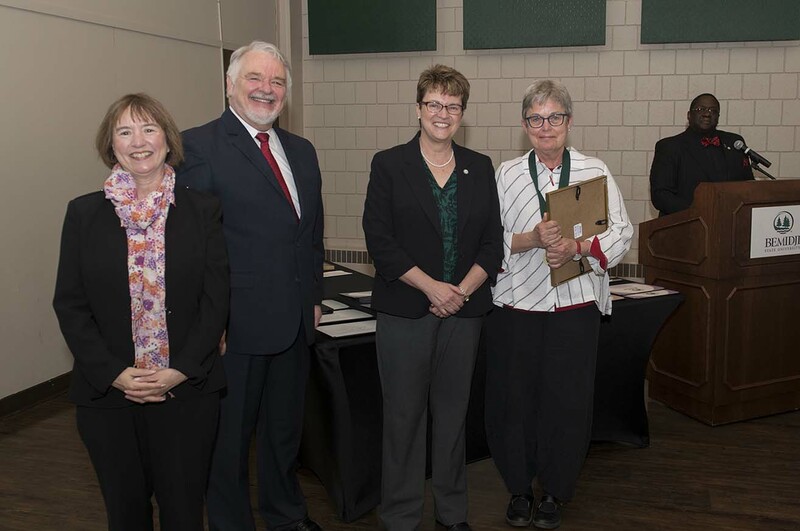 Dr. Carol Nielsen (far right) was named professor emerita of business administration and also won a BSU Distinguished Service Award. She’s pictured with (L to R) VP Karen Snorek, VP & Provost Tony Peffer and President Hensrud. 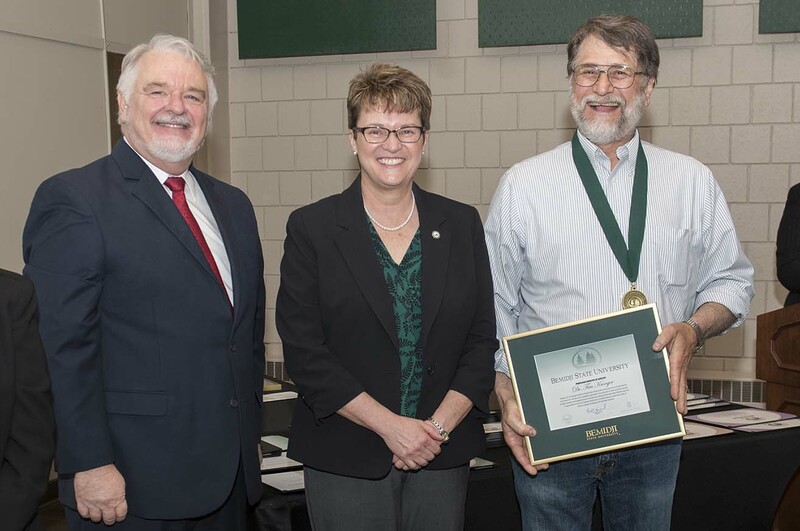 Dr. Dragoljub Bilanovic (far right) was named professor emeritus of environmental studies. 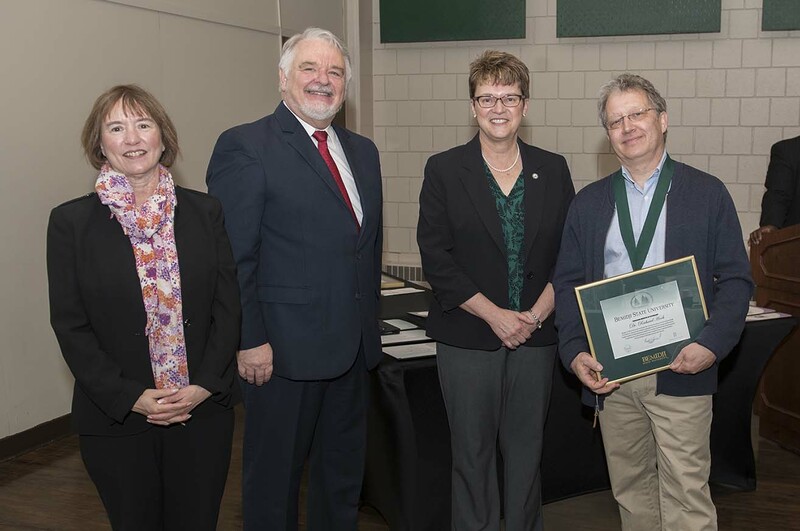 He’s pictured with (L to R) VP Karen Snorek, VP & Provost Tony Peffer and President Hensrud. 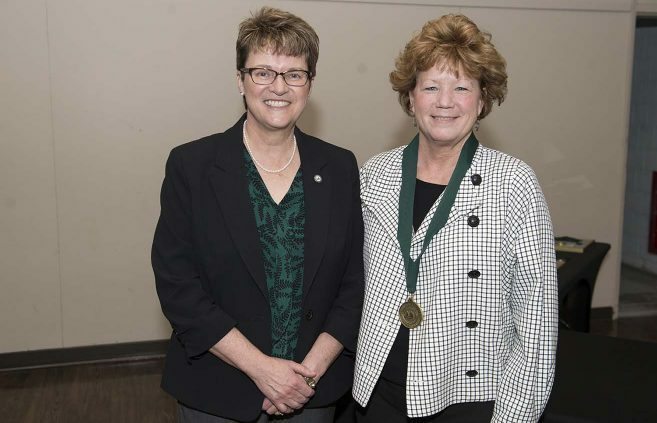 Dr. Cheryl Byers (far right) was named professor emerita of social work. 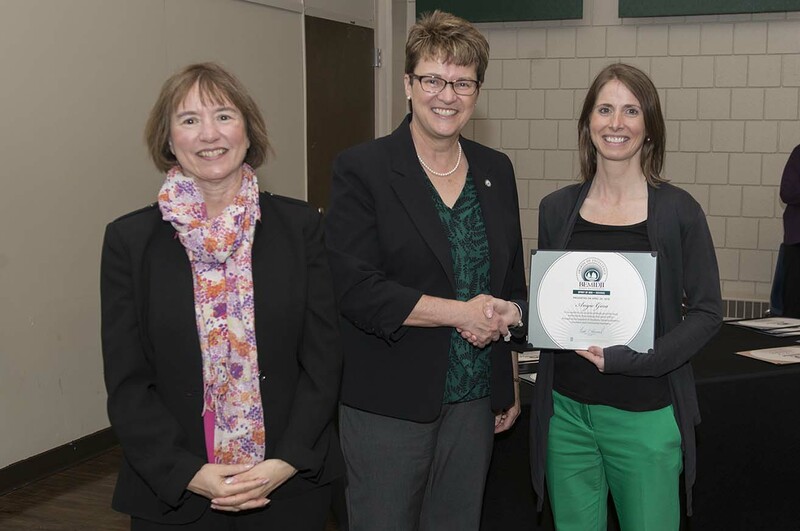 She’s pictured with (L to R) VP Karen Snorek, VP & Provost Tony Peffer and President Hensrud. Dr. Laurie Desiderato (far right) was named professor emerita of psychology. 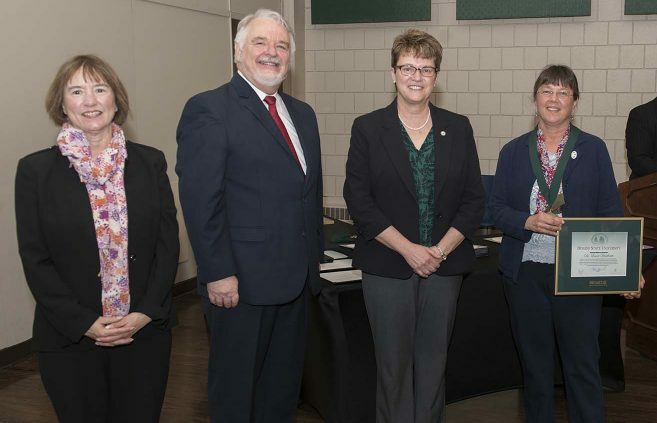 She’s pictured with (L to R) VP Karen Snorek, VP & Provost Tony Peffer and President Hensrud. Dr. Richard Hook (far right) was named professor emeritus of psychology. 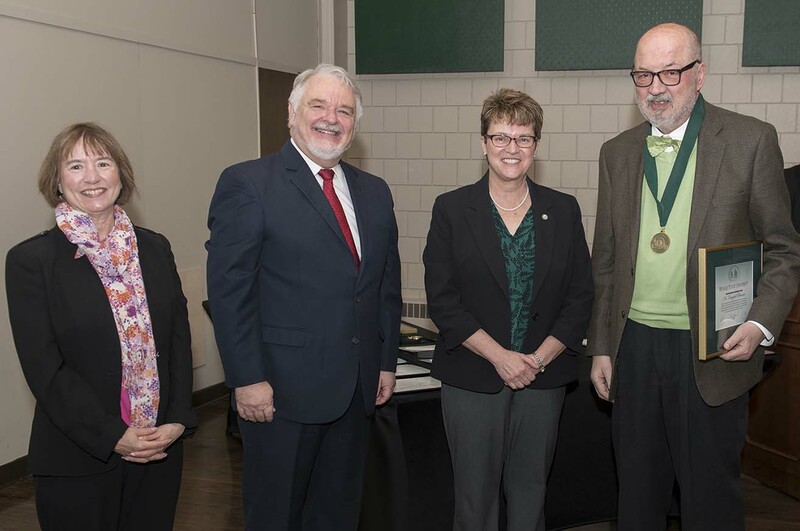 He’s pictured with (L to R) VP Karen Snorek, VP & Provost Tony Peffer and President Hensrud. 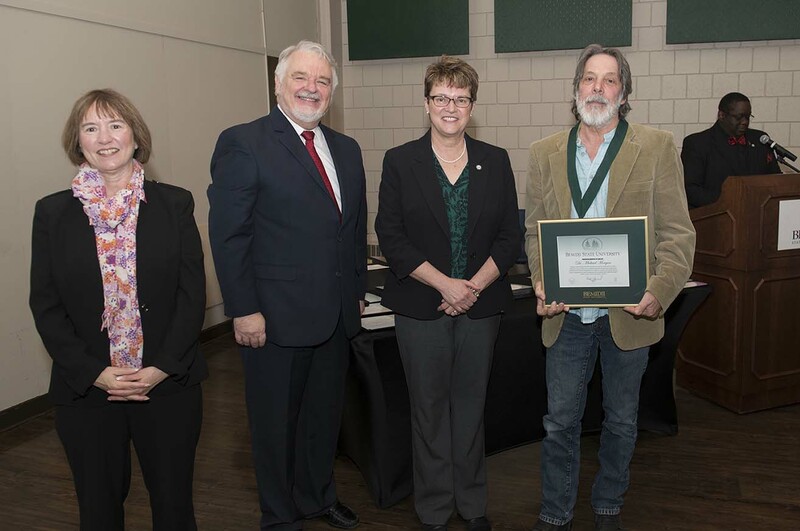 Dr. Tim Kroeger (far right) was named professor emeritus of geology. 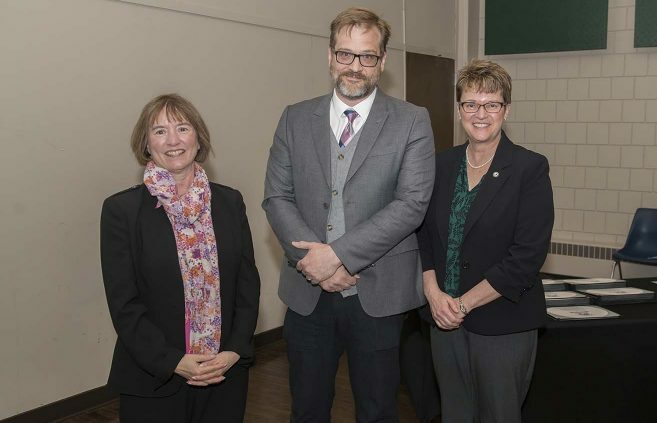 He’s pictured with (L to R) VP Karen Snorek, VP & Provost Tony Peffer and President Hensrud. Dr. Mike Morgan (far right) was named professor emeritus of English. He’s pictured with (L to R) VP Karen Snorek, VP & Provost Tony Peffer and President Hensrud. Marla Patrias (right), executive director of BSU Alumni & Foundation, is retiring in May after 20 years at BSU. She’s pictured with President Hensrud (left). Sandy Beck (center) was recognized for 25 years of service, won an Outstanding Contribution Award and received a Diversity Certificate. She’s pictured with VP Karen Snorek (left) and President Hensrud. Dr. Tom Beech (center) won an Outstanding Contribution Award. He’s pictured with VP Karen Snorek (left) and President Hensrud. 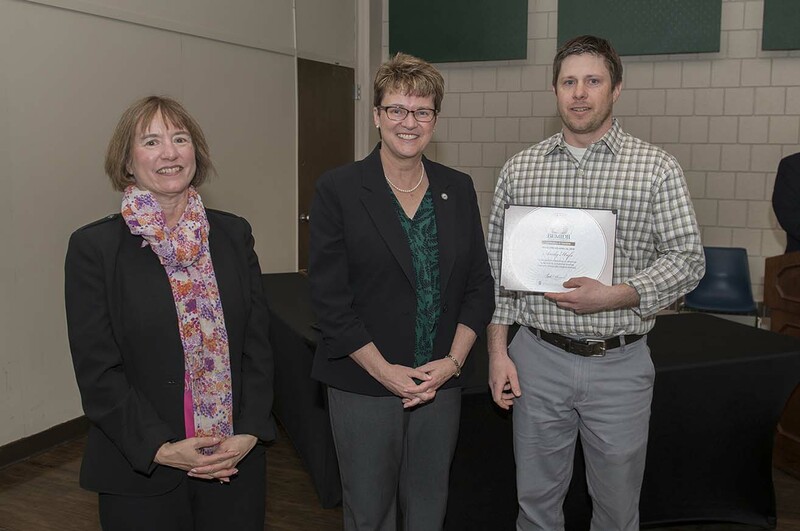 Andy Bartlett, associate director of communications and marketing, was BSU’s nominee for the 2018 Minnesota State Board of Trustees Professional Excellence in Service Award. 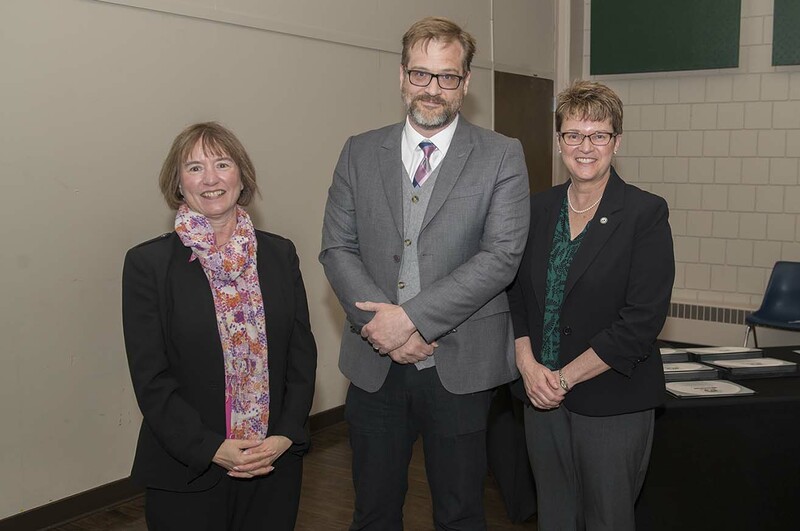 He’s pictured with VP Karen Snorek (left) and President Hensrud. Mary Herried (right) accepted an Outstanding Contribution Award on behalf of Dr. Shannon Norman. She’s pictured with VP Karen Snorek (left) and President Hensrud. 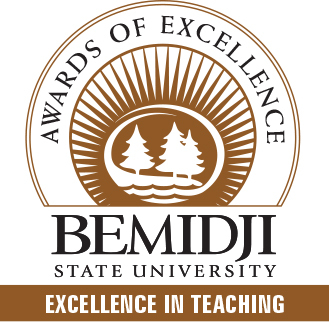 Bemidji State University recognized 61 employees with 690 combined years of service, nine faculty members who have been granted emeriti status, 14 retiring staff members and winners of the university’s Awards of Excellence at its annual Employee Recognition Celebration April 26. 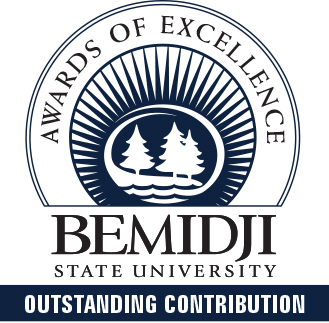 BSU’s Awards of Excellence include the Spirit of BSU Awards, Outstanding Contribution Award, Excellence in Teaching Award and Distinguished Service Award. 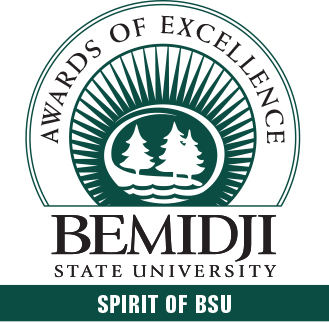 The Spirit of BSU Award recognizes individuals or teams whose positive attitude and infectious enthusiasm embody the Spirit of BSU through active support of students, student-athletes, co-workers and community members. 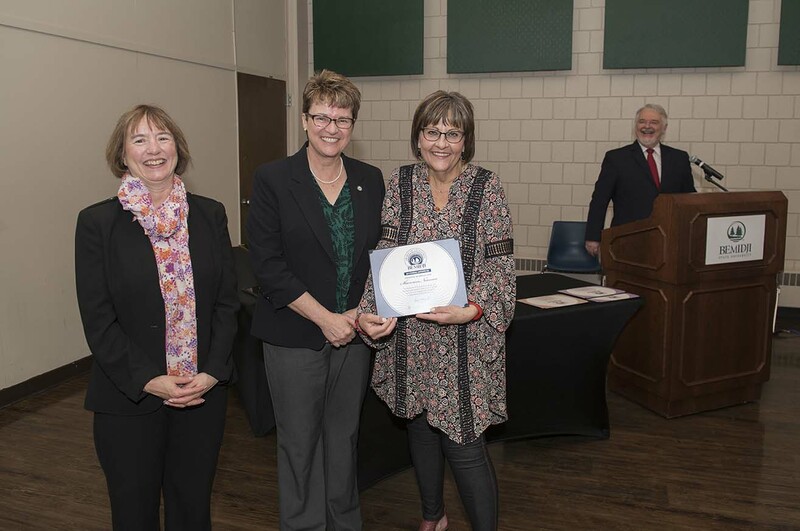 Gora was recognized for her work planning and supporting the opening ceremony for the university’s recent Centennial celebration kickoff, and for her advocacy for the good health of her colleagues and for the Bemidji community. BSU’s grounds and facilities crew was recognized for removing more than 50 inches of snow and ice from campus grounds during this past winter. They were noted for their ability to respond to unpredictable demands and for their efforts to ensure the safety of pedestrians on campus grounds. The Outstanding Contribution Award is given to an individual who has gone above and beyond expectations to contribute in areas of student success, civic engagement, diversity, sustainability and/or public service. Beck has been at BSU for 25 years, but only recently was promoted into her current supervisory role. She has used her new leadership responsibilities to improve her team’s culture and bring it the resources it needs to effectively serve the university community. Beech was noted for his leadership in encouraging BSU students to study abroad and for his personal commitment to supporting BSU’s international students. He has endowed one scholarship to support students and is funding a second. 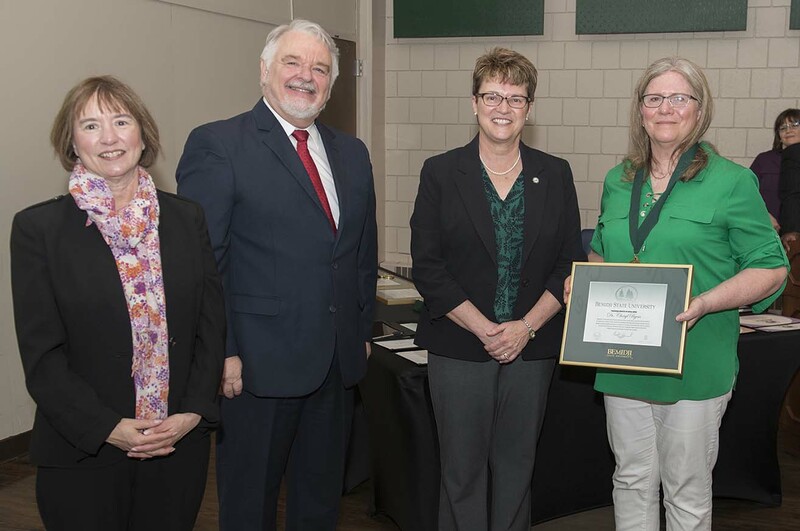 Norman, who has made a tremendous impact at BSU in her four years on the faculty, was noted for her work to advise over 160 students and for her active service to the university through on-campus committee and leadership roles. 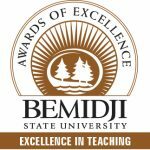 The Excellence in Teaching Award is given to a faculty member who has demonstrated teaching excellence through evidence of exceptional learning outcomes and quality student advising. Hafs, in his sixth year at BSU, has published nine peer-reviewed articles and received more than $300,000 in external grant funding. With that grant support, he trains new scholars by incorporating research and research methodologies into his courses and by supporting students in presenting their work at regional and national conferences. 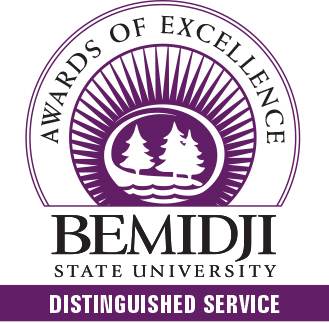 The Distinguished Service Award is presented to a faculty or staff member who has been at BSU for at least five years with an ongoing record of superlative performance and professional excellence combined with significant personal impact in the areas of student success, civic engagement, diversity, sustainability and/or public service. Nielsen is retiring after more than three decades in a variety of leadership roles on campus which have included two term as an interim dean, director of the Center for Professional Development and membership on Faculty Senate. She has been a popular adviser for business administration and pre-law students, and she volunteers extensively in the Bemidji community. Swartz has become perhaps BSU’s most visible employee in his 35 years, sharing the experience of studying, teaching, performing and living at BSU to countless audiences through the images he captures and shares. 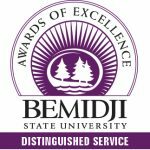 BSU also recognized the first three recipients of the university’s new Diversity Certificate, which recognizes employees who complete 15 hours of qualifying diversity-related training or activities during an academic year, and the university’s nominee for the 2018 Minnesota State Board of Trustees Professional Excellence in Service Award. 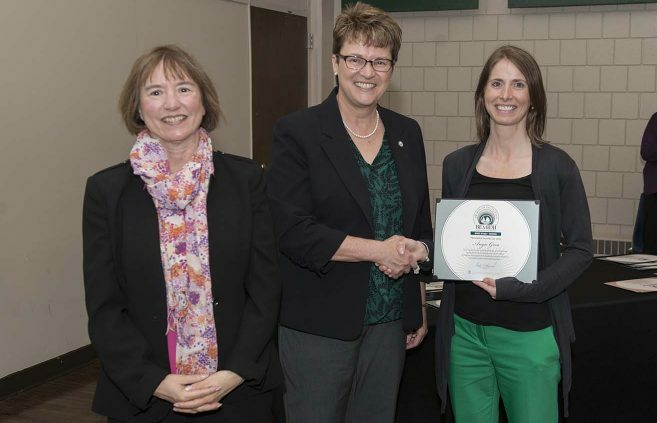 The Diversity Certificate recipients were Sandra Beck, facilities services supervisor, Physical Plant; Patty Hartshorn, office and administrative specialist for the School of Graduate Studies; and Dr. Colleen Livingston, professor of mathematics. 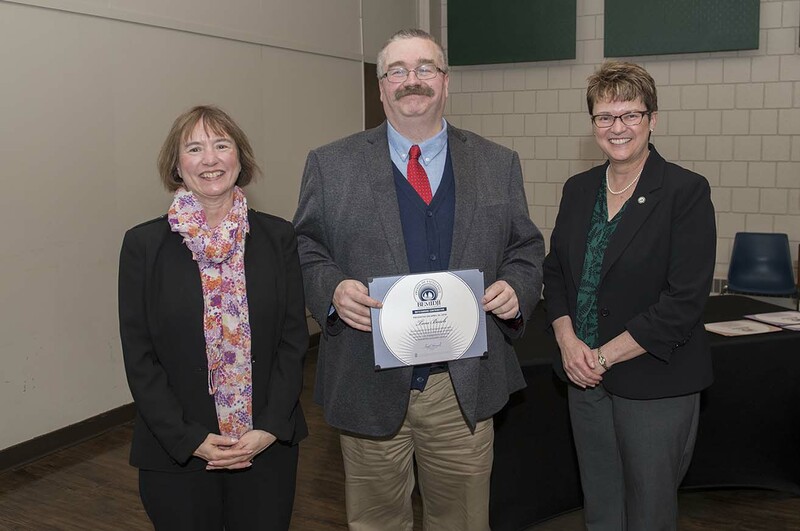 Andy Bartlett, associate director of communications and marketing, was recognized as BSU’s nominee for the Board of Trustees award. 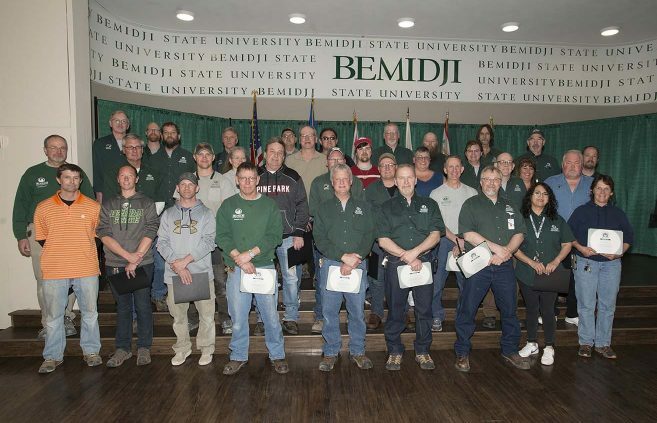 Bemidji State’s 14 retiring staff members have a combined 316 years of service to the university, including five who have been with the university for more than 30 years. Nine retiring faculty members have been granted emeritus status and were recognized at the celebration. 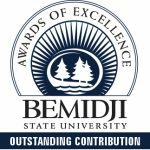 Bemidji State University, located amid the lakes and forests of northern Minnesota, occupies a wooded campus along the shore of Lake Bemidji. Enrolling more than 5,100 students, Bemidji State offers more than 80 undergraduate majors and eight graduate degrees encompassing arts, sciences and select professional programs. BSU is a member of the Minnesota State system of colleges and universities and has a faculty and staff of more than 550. The university’s Shared Fundamental Values include environmental stewardship, civic engagement and international and multicultural understanding.